It would hardly be an exaggeration to say that Armenia and Turkey have been balancing on the brink of war since February 1919, when the Ottoman Turkish government made an attempt to normalize bilateral relations by offering autonomy to Western Armenia within the Turkish state and proposing some population exchange in the most sensitive areas. Misled by the hopes for being compensated by the West for the loyalty and for the dramatic events of 1915-1918, the Armenian government rejected the Turkish overture, stating that Armenian people were not willing to stay within Turkey after the events of 1915 as well as that the Turkish state had lost any moral right for the historical Armenian lands. Furthermore, on the 28th of May, 1919, the Armenian government declared its willingness to annex the six vilayats of Western (Turkish) Armenia. That was in fact, casus belli for any Turkish government as well as for the majority of the Turkish society and especially for the nationalists and revanchists of the Turkish National Movement who were active in Central Anatolia and Western Armenia as early as May, 1919, and nine months later were dominant in the area under the leadership of Mustafa Kemal Ataturk. 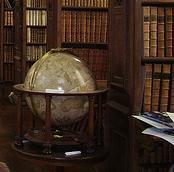 The aftermath of the Treaty of Sevres was marked by the following paradox. On the one hand, Armenia was supposed to take over the territory now legally assigned to her by the victorious Allies and was willing to do so. But on the other hand, the Turkish Kemalists who in fact, controlled the territory assigned to Armenia together with most of Anatolia, did not recognize the Treaty that had been signed (although never ratified) by the powerless government of Sultan Mehmed VI based in Constantinople and were not planning to give up any territory that they considered Misak-i-Milli (Turkish heartland). Furthermore, from the Kemalist/Nationalist perspective, Misak-i-Milli included not only Western Armenia but at least half of the territory controlled by the Armenian Republic in August, 1920 (all the territory west of the Russo-Turkish border of 1877). Facing the above paradox the Democratic Republic of Armenia could enforce provisions of the Treaty of Sevres only through successful military action, but was the tiny republic of the South Caucasus capable of completing that task? By the end of summer of the year 1920, Armenia could boast less than 30 000 soldiers against the 50 000 strong Turkish army of Nizam Karabekir Pasha stationed at her pre-treaty borders despite the fierce fighting going on in Western Anatolia between the Kemalist Turks and Greeks who were trying to secure their own gains as per the Treaty of Sevres. In addition to the regular troops, Karabekir could rely on numerous irregulars who were also prepared and willing to fight for the Turkish case against Armenians. As for the Armenian army that was believed to be the best trained and the most disciplined among other armies of the South Caucasus, it would hardly be an exaggeration to say that it was exhausted - morally, physically and financially as a result of the series of almost non-stop warfare starting with 1915. In terms of international support, one could add to the above that the events that followed the Treaty of Sevres in the South Caucasus clearly demonstrated Armenia could hardly count on any serous external help while the Kemalist (Nationalist) Turkey enjoyed both diplomatic and military support on behalf of the Soviet Russia and its puppet-state of Soviet Azerbaijan. Several weeks before the treaty of Sevres was signed, Armenian border troops entered the district of Olti, the territory that formally did not belong to Turkey but in fact, was controlled by the irregulars of local Muslim warlords ( predominantly Kurdish ones) as well as by some regular Turkish troops under the command of Turkish and Azerbaijani officers who were stationed there in breach of the Armistice of Mudros. The Armenian advance began on June 19, 1920, and by June 22 most of the district including the towns of Olti and coal-reach Peniak were put under Armenian jurisdiction (see Map 8). From Turkish Nationalist perspective, it was the incursion of the Armenian troops into the district of Olti that served as an official pretext for the new Turkish-Armenian war. One should add to the above that the war could have been avoided if the governments of Armenia and Georgia would have succeeded in the establishment of a military alliance aimed at preservation of their independence and territorial integrity. The government of the First republic undertook some demarches in that direction in mid-August, 1920 largely under the influence of Lt.-Colonel Claude Stokes (new British chief Commisioner in the South Caucasus) who was a strong believer that Armeno-Georgian alliance could have not only secured the area from the new Turkish expansion but could have also resulted in forcing the Soviets out of Azerbaijan. The possibility of such an alliance was a great concern for the Turkish Nationalists even in the midst of the Turkish-Armenian war that started 40 days upon the signing of the treaty of Sevres. Nevertheless, the projected Armeno-Georgian alliance never occurred due to the inability of the governments of both nations to overcome their differences and due to the efforts of Turkish diplomacy in Tiflis. It would be beyond the framework of this essay to provide a detailed analysis of the Turkish-Armenian War that broke out in early September, 1920, when the Turkish army under Karabekir enforced by local Muslim militiamen, launched a full-scale offensive along the whole perimeter of Turkish-Armenian border. We would only take the liberty to mention that the leadership of the First Republic definitely under-estimated both military and ideological strength of Turkish nationalists overestimating, at the same time, their own resources and forces as well as the possible support on behalf of their Western Allies. On September 24 the war was officially declared. Within the following week, the defense lines of Armenian forces collapsed and the Turks took over the towns of Sarykamysh, Kaghyzman, Ighdyr and Merdenik (see Map 9). The advancing Turkish armies were devastating the area and wiping out the civil Armenian population that did not have time or willingness to flee. Simultaneously, some of Armenian regiments reportedly started performing ethnic cleansing in Kars and Erevan counties that still remained under Armenian control. While Armenia was busy trying to withstandthe new Turkish aggression, the Soviets made one more attempt to “pasify” Zanghezur. On September 3 the components of the 11th red Army under General Nesterovsky launched an offensive against Njdeh pressing his fighters southwards beyond Kapan and Katar. Three weeks later the combined Soviet-Turkish and Soviet-Azerbaijani forces started incursion from Nakhichevan and Jabrail in the direction of Meghri. Despite such dramatic development the militias of Zanghezur succeeded in defeating the enemy groupings one after another and by the end of the second week of October they re-conquered Kapan and Katar from Nesterovsky and chased the Soviet-Turkish corps under the cpmmand of Veysel Bey back to Nakhichevan (see Map 9). Meanwhile, during the two-week lull that followed after the loss of Penyak, Sarykamysh, Peniak and Merdenek, Georgia attempted to take over the remaining part of the disputed Ardahan (see Map 9). On October 1 1920, Georgian troops occupied the small area near Chyldyr lake and entered the village of Okam (Gyole) on the ”Armenian side” of Kura. The above demarche caused indignation and protests on behalf of the Armenian Foreign Affairs ministry especially keeping in mind that the capture of disputed area was taken place during the negotiations Tiflis regarding the possible Armeno-Georgian alliance aimed against Soviet and Turkish expansion. The talks ended up with no result partially due to the efforts of Turkish diplomats in Tiflis who in fact encouraged the government of Georgia to take over the disputed territories to the south of Ardahan. A few days after the Georgian incursion south of Kura, the Armenian command ordered the West Armenian regiment of Sebough to move into Okam. In order to avoid military confrontation, the Georgian troops evacuated Okam on October 6 and retreated back to Ardahan. The Chyldyr sector with the town of Zurzuna remained under Georgian control, and on October 13 it was ceremonially declared Georgian. The very same day the lull at the Turkish front was broken, and the Republic of Armenia was in no position to re-take Chyldyr from Georgia. Ironically, just four months later that was taken over by the Turks as a result of the Soviet-Turkish conquest of Georgia. In early October 1920, Armenian Republic addressed the governments of Great Britain, France, Italy and other Allied powers asking them to force the Turks to stop their offensive, but all the desperate pleas for help seemed to fall upon deaf ears. Great Britain had to concentrate most of her forces available in the Middle East to crush the tribal uprisings in Mesopotamia (now Iraq). France and Italy had similar problems in Syria, Cilicia and Adalia. The only country who provided some support through active operations at the Turkish western front was Greece. But Greek military support was not sufficient to ease Turkish pressure on Armenia. On October 30, the Armenians left Kars to the Turks. Five days later Turkish Army approached the Arpachay river threatening Alexandropol. At that moment the government of Armenia requested for cease-fire that was granted under the condition of Armenian withdrawal from strategically important city of Alexandropol. On November 7 the Turks entered the city upon the Armenian acceptance of Turkish conditions, and the peace negotiations between Turkish Nationalists and the Armenian republic started. However, the harshness of Turkish demands the acceptance of which would virtually turn Armenia into a Turkish protectorate resulted in the interruption of negotiations, and the warfare resumed on November 10. As a result of the new Turkish offensive the strategic town of Agin south of Alexandropol fell to the Turks on November 12, and the Armenian troops were in retreat to the east along Alexandropol – Karaklis railroad. The same day Armenian troops and population started evacuation from Surmala crossing Aras river near Echmiadzin (see Map 10). At this point the Turkis were getting ready for the final spurt on Erevan. 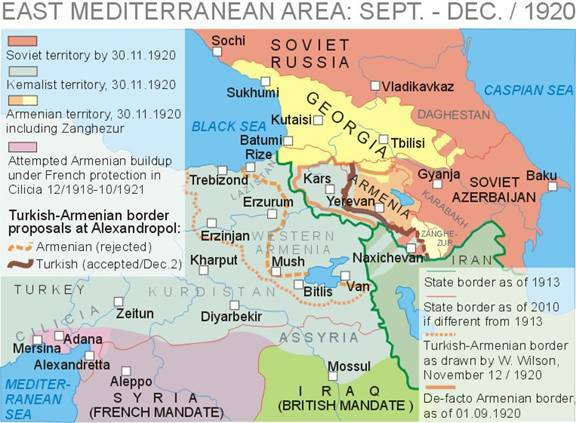 Ironically enough, it was the beginning of November when US President Wilson was done with the final sketches of the Sevres-based Turkish-Armenian borders (see Figure 3.4). Next day the troops of Georgia took over the Neutral Zone (the Shulavera Condominium) established between the two countries in early 1919. The Government of Armenia gave permission to that Georgian action in order to prevent the occupation of this disputed territory by the Turks. However, the Georgians marched a bit further southwards taking over the whole of the former Lori sector which Tbilisi considered unequivocally Georgian from the first day of independence (see Map 10). After a very quick plebiscite the whole sector was annexed by Georgia to stay within that country for another twelve months. We do not possess any information that would confirm or refute whether the procedure of that plebiscite was properly organized but in any case, the vote of local Armenian population in favor of Georgia was rather logical keeping in mind the circumstances of the Turkish-Armenian war and the defeat of the First Azerbaijani Republic. Incorporation into Georgia at least guaranteed inviolability of Armenian lives and property in the sector while possible Turkish occupation definitely meant the loss of both. It was also reported that on November 15 1920, Turkish Nationalist envoy in Tiflis, Colonel Kiazim Bey gave the Georgian government guarantee of Georgia’s territorial integrity as the reward for her neutrality in the Turkish-Armenian war and ask to grant his country an exclusive right for the railroad sector from Sanain to the Azerbaijani border at Poily. It might be important to mention here that Georgian annexation of the territories claimed by Armenia were never subjected to any forms of ethnic cleansing unlike the Armenian territories taken over by Turkey and, to a certain extent, Azerbaijan. In the middle of November the new Turkish offensive started in the direction of Erevan from Nakhichevan. In breach of the Soviet-Armenian Treaty of August 10, the Nakhichevan expeditionary corps contained the components of the Soviet 11th Army. Between November15 and 16 demoralized Armenian troops left Shakhtakhty and all of Sharur with little or no fight and stopped Soviet-Turkish offensive only at Davalu on November 17 1920 (see Map 10). The only war theater where Armenians had significant success was Zanghezur. In that mountainous county Armenian forces of Colonel Njdeh successfully repelled another Soviet-Azerbaijani invasion from Jabrail in early November and on November 09 started counter-advance towards Goris (Gerusy). By November 22 the Armenians of Zanghezur assisted by an expeditionary corps from Daralaghez completely defeated the Soviet forces of General Pyotr Kuryshko (who replased Nesterovsky in late October, 1920) and re-took the towns of Goris, Tatev, Darabas and Angelaut expelling the reds out of the county as far as Abdalar near the old administrative border of Karabakh (see Map 10). Facing total collapse of the First Republic, the leadership of Armenia requested an armistice for the second time during the war, and on November 18 1920, a cease-fire agreement was concluded. A week later, on November 24, Armenian and Turkish representatives started peace negotiations in Alexandropol. As a precondition for any talks, the Armenian delegation headed by Alexander Khatisov was forced to renounce the Treaty of Sevres. After having complied with that demand under pressure the Armenians presented their border proposal. Giving up most of the former Turkish Armenia including the cities of Bitlis, Erzurum and the coastal city of Trebizond granted at Sevres the the delegation of the Armenian Republic asked for the small parts of the vilayats of Van and Bitlis with the cities of Van, Bayazet, Mush and Khnys as well as for the narrow corridor in Lazistan with the town of Rize. As for the former Russian Armenia, the Armenians hoped to keep the whole of the province of Erevan and the territory of Kars (see Figure 3.5). The Armenian proposal was flatly rejected by the Turkish delegation presided by General Nizam Karabekir Pasha as absolutely non-realistic and even insulting. Instead, the Armenian delegation was to accept unconditionally the Turkish provisions that were quite severe. Armenia was to disarm most of her military forces and cede more than a half of her pre-war territory. All of the Kars territory with the districts of Sarykamysh, Kars, Kaghyzman, Olti and the Armenian sector of Ardahan district was to be ceded to Turkey, as well as the county of Surmala in the province of Erevan with the city of Ighdyr and Mount Ararat. The county of Nakhichevan combined with the Sharur sector of the county of Sharur-Daralaghez were to be placed under Turkish protectorate (see Figure 3.5). Self-explanatory, Armenia was not receiving any parts of the Turkish Armenia that was now referred to as “Eastern Anatolia” by the Turks. The Armenian Republic was also supposed to limit her relations with the Allied Powers. According to Karabekir, the Turkish-drafted border between Turkey and Armenia was based on “ethnical principle” that could not justify incorporation into Armenia of any territories where Armenians had not formed majority before the outbreak of the First World War. At 2 o’clock in the morning on December 3, the new peace treaty between Turkey and Armenia was signed in Alexandropol by Karabekir and Khatisov. At the very last moment the Armenian delegation attempted to reach agreement on a few border adjustments that would leave Armenia with Sharur-Nakhichevan, Mount Ararar and the ruins of Ani (mediaeval capital of Armenia) in the district of Kars, but their Turkish counterparts were inexorable. The only concession granted to the Armenians was some smaller territories in Aghbaba sector of the district of Kars to the north-west of Alexandropol. The new Armeno-Turkish border was drawn, and it virtually never changed up to these days. The Final Soviet takeover, 11/1920 – 02/1921; Karabakh-Zanghezur and Nakhichevan recovered by Armenia? Ironically, the delegation headed by Khatisov that signed the peace treaty with Turkey on December 3, had no formal right to do that due to the change of power that occurred in Erevan 8 hours earlier on December 2 at 18:00. While the Armenian government was trying to terminate the lost war against the Kemalists begging the enemy for peace no matter how harsh and humiliating its conditions could be, the Soviets were taking over what was left of the First Republic. As early as on November 19 1920, the Soviet plenipotentiary in Erevan Boris Legran and his staff started the arrangement of the bloodless Sovietization of Armenia following the instructions from the Kremlin. The Dashnakist leadership of Armenia were to be persuaded that that would be the only way to save Armenian people as well as some form of the Armenian statehood. At the same time, the Kavburo in Baku dominated by Orjonikidze and Stalin was more impatient about the rapid conquest of exhausted Armenia than Lenin and Chicherin in Moscow. Contrary to the instructions coming from their communist party bosses from the Central Committee in the Kremlin, the Caucasian Bolsheviks formed the Armenian Revkom (Military Revolutionary Committee) in Baku on November 22, 1920, that was designed to become the new communist government of Armenia. Three days later the Revkom departed for Kazakh were the units of the Soviet 11th Army under General Kuryshko (just recently defeated in Zanghezur) were preparing for the invasion of Armenia. Same day the “Special Armenian Rifle Regiment” previously stationed in Kedabek was re-deployed to Kazakh as well. The invasion started o the night of November 28-29 by crossing the demarcation line between Armenia and Soviet Azerbaijan south-east of Kazakh in the direction of Karavansaray and Sevkar (Karadash). The two towns fell into the hands of the Reds after some resistance on behalf of Armenian border guards and militias was crushed by the end of November 29. 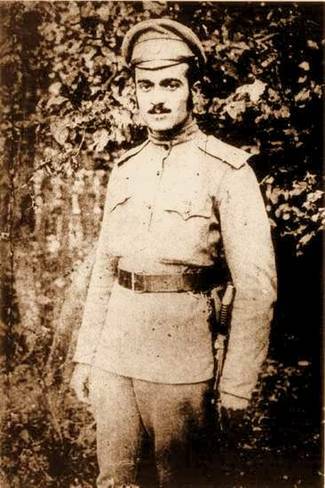 The attempts of Armenian General Seboukh (Arshak Nersisian) to organize counter-offensive from Dilijan failed due to the unwillingness of the Armenian soldiers to fight one more war against superior enemy, and on November 30 the Red Army was already in Dilijan from where the Sovietization of Armenia and the overthrow of the Dashnakist government was proclaimed. Later, the soviet historians portrayed that military operation as a “communist uprising of November 28 in the district of Kazakh” (see Map 11). The Soviet invasion from Kazakh not only shocked the Armenian government but greatly confused Boris Legran who had not been informed on those plans of the Kavburo. Nevertheless the reaction of the Soviet envoy was quick and effective. By December 2, Legran successfully pressured the Parliament and the Cabinet of Simon Vratsian to step down and officially transfer the whole power to General Dro pending the arrival of Revkom to Erevan. Two days later, on December 4, Dro left Erevan for the lake Sevan area where he welcomed the Revkom and, in turn, gave up his power to the new Bolshevik administration. Two more days later, the first units of the red Army entered the Armenian capital. That was the end of the First republic, and independent Armenian statehood was interrupted for more than 70 years until August 1991. The Sovietization of Armenia was accompanied by some events that at first sight, looked like the resolution of the territorial dispute over Karabakh, Zanghezur and Nakhichevan. As has already been mentioned above, the Soviet takeover of some territories claimed by both Azerbaijan and Armenia did not necessarily imply their official status. The documents and governmental correspondence of the described period proves that Soviet envoys in the South Caucasus used to promise the disputed territories to Azerbaijan while talking to the new Soviet leadership in Baku or the Kemalist representatives, and to Armenia as a price for her Sovietization when talking to Armenian communists. Sometimes they went so far as to make absolutely unrealistic proposal according to which “no single Armenian village will be given to Azerbaijan while no single Muslim village will be given to Armenia”. But while promising territorial concessions to all potential allies the Kremlin tried to keep Karabakh, Nakhichevan and parts of Zanghezur as long as possible under Soviet Russian military administration. The Power Transfer Document compiled on December 2 1920, and published in 1928 In Moscow and Paris contained Paragraph 3 that defined the territory of the Sovietized Armenia as recognized by the Russian Soviet Government. It included the whole of the province of Erevan with the counties of Surmala, Sharur-Daralaghez and Nakhichevan, Southern sector of the county of Borchalo in the province of Tiflis, the whole of the county of Zanghezur in the province of Elizavetpol and parts of the county of Kazakh and the territory of Kars that were not clearly defined (see Map 11). Ironically enough, neither the last Dashnakist government, nor the first Soviet administration in Erevan could boast effective control even over the half of the above territory. However, the above document is important in terms of serious territorial concessions that the Kremlin was prepared to offer Armenia at the very first stage of her Sovietization. Just the day before, on December 01, 1920, a few hours prior to the power transfer in Erevan and two days after the declaration of the Sovietization of Armenia by the Kazakh-Dilijan Revkom, the Soviet government of Azerbaijan (also referred to as Azrevkom) sent its greeting to its Armenian accomplices and declared that from the moment of the fall of “the Dashnakist regime”, the Soviet Azerbaijan was giving up the disputed territories of Karabakh, Zanghezur and Nakhichevan in favor of the Soviet Armenia. That act of the Soviet leadership of Azerbaijan was later revoked as will be described below, but it was widely used by the Soviet propaganda to create a myth that only the Bolsheviks with their “communist internationalism” have proven to be the only power in the world capable to resolve long and violent territorial disputes like the one between Armenia and Azerbaijan. Richard G. Hovannisian. The Republic of Armenia, Vol. IV: Between Crescent and Sickle: Partition and Sovietization, (Berkeley, 1996), p.98. 20N/187, dossier 1, Rport on political situation, Nov. 1-15, 1920.